WIN! Survive The Party Season With Vita Coco 100% Natural Coconut Water - 5 Cases Up For Grabs! Rihanna and I might not have all that much in common but I'll give her this: she knows how to party. And she also knows that it's essential to rehydrate on the morning after the night before. 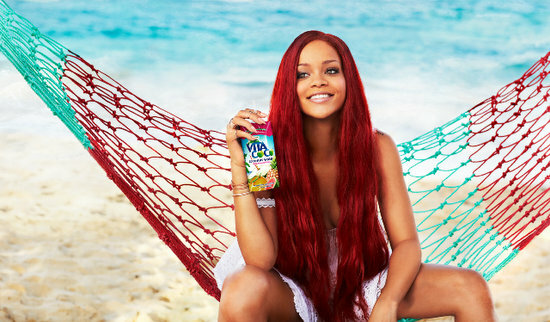 I've been taking a leaf out of her book over the festive season and giving my body a little helping hand with Vita Coco, 100% Natural Coconut Water. Packed with naturally occurring potassium and essential electrolytes, I've found that it really does help me when I've had that one sherry too many! With no colourings, preservatives or flavourings and never produced from concentrate, it offers a great natural way to boost your body's hydration levels. And I have five cases to give away - one each to one of five lucky readers of Fluff and Fripperies. This one is open to residents in Republic of Ireland only - just pop your details into the box below. Good luck everyone! Sounds good - I like that it's all natural and would love to try it. I had a free sample of this in my Cosmo goodie bag. Unfortunately I hated it, which I'm gutted about as it's soooo good for you! Have never tried coconut water but trying a health kick.. Fingers crossed! I had the mother of all hangovers the day after St Stephens Day, I've heard people say how good this is. I NEED IT IN MY LIFE. Could do with this to recover from the festive season!! Another super prize - fingers crossed! i left a comment but i cant see it ?